Climate change has become a political controversy - but it is not a scientific one. While certain factors may seem negligible on the surface (chunks of a glacier falling into the ocean) or even hopeful (surface temperature in one region at a temporary plateau), they are part of a larger picture. When the full body of evidence is considered, it is undeniable that climate change is not only happening, but is set to change our lives as we know them in fairly short order. This doesn&apos;t just include the traditional example of losing polar bears due to a lack of arctic ice; climate change will affect economies, agriculture, and security in a major way. 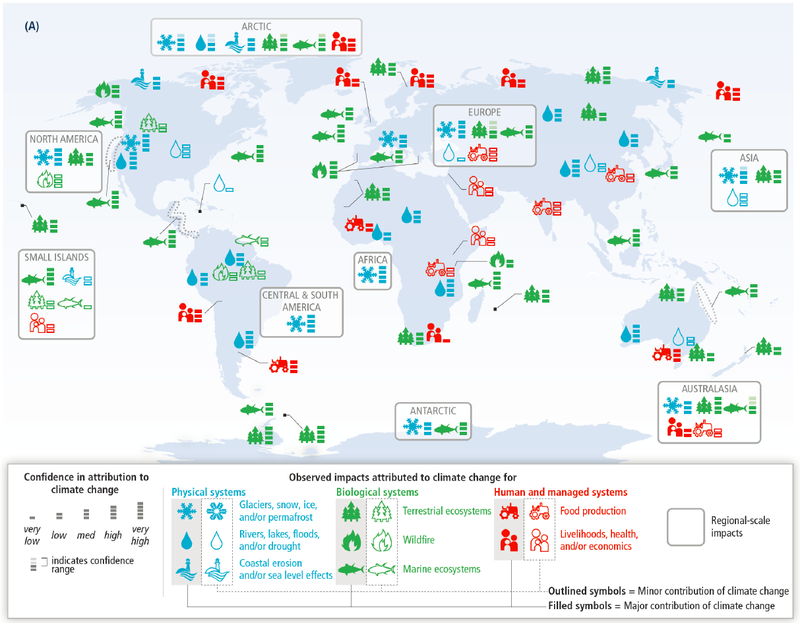 Today, the Intergovernmental Panel on Climate Change (IPCC) Working Group II released their report, entitled Climate Change 2014: Impacts, Adaptation, and Vulnerability. The report utilized input from 1,729 experts and government reviewers. This number also included nearly 750 primary or contributing authors of scientific papers. Their report concludes that the potential damage from a changing climate is huge, and humanity is currently ill-prepared to deal with the fallout. -Vulnerability. This aspect deals with the likelihood that an area will be adversely affected by climate change. -Exposure. The amount of species, ecosystems, resources, communities, etc. that would be harmed by climate change. -Hazards. The combination of natural fluctuations and man-made factors that could threaten a given area. While no area will be exempt from feeling the effects of climate change, the report does note that not everyone will be affected in the same way. While some regions will experience increases in rainfall, others will deal with severe droughts. This could be disastrous to agriculture and the global food supply. These changes have already begun in some areas. If proper precautions are not taken in the areas that are in the greatest amount of danger, the report warns that with melting glaciers there will be increased flooding, damaging homes and cities on islands and in coastal areas,such as New York, Tokyo, and Shanghai. Widespread hunger may set in, due to the previously mentioned fluctuations in rainfall. Additionally, more frequent violent storms also threaten property, emergency services, and reliable delivery of electricity. Not only does this affect the people living there, but also all of the infrastructure and economic viability coming out of those areas. As resources become increasingly scarce and security becomes less of a guarantee, human conflict is expected to rise. These results echo the findings of Working Group I that were announced in Stockholm last September. Working Group III will announce the results of their report from Berlin, Germany on April 13, 2014. The Synthesis Report of the Fifth Assessment Report will be discussed in Copenhagen at the end of October, though the press conference to announce the results has not yet been scheduled.